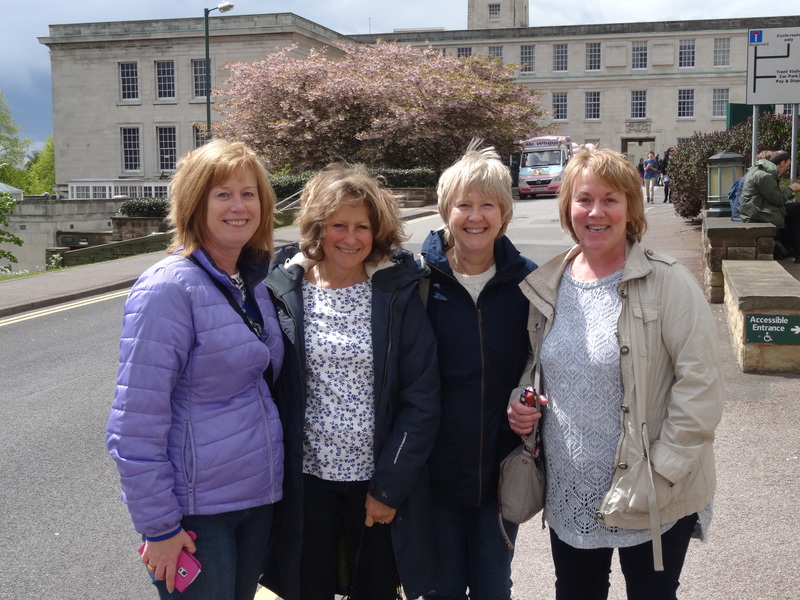 “We live as far apart as Kent and Lancashire, but now our families are grown up we meet up every year and this year we chose Nottingham, because of May Fest. We wandered around campus taking in Portland Building (PB), Trent Building, a few Halls of Residence and the lake. Quite a lot has changed. The ballroom had been changed into a café and the lido had long since gone to be replaced by the new Arts Centre. The old red brick student shop building and the bank have gone, being replaced by lovely new facilities behind PB. The trees had grown lots (…or have we just shrunk?). We couldn’t find the canoe club mending shed which used to be located at the side of PB. We remember mending holes after competitions in the shed, with a rock band practicing in an adjacent den. I’ve always wondered whether that rock band became famous. 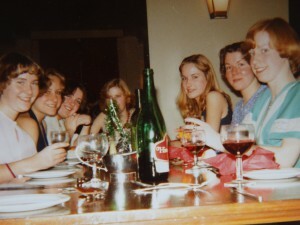 Formal dinner FB 1977: Sue, Jane, Lis, Alison, Vanessa, Janet and Liz. We were privileged to be shown round Florence Boot (FB) and on arrival; we were all 19 again for a while. Memories came flooding back and we were even invited into the sanctuary of the SCR. We only rarely stepped foot in there for sherry receptions before a formal dinner! Pictures had thoughtfully been laid out for us. There was even a year photograph, which we studied. Not one of us was in it and we racked our brains to remember why. There were lots of old friends there but where were we? It came after a lot of mental chugging that we had most likely been on a trip to Skegness and would at that moment have been paddling on the boating lake. Little did we know we’d one day be sorry we’d missed the photo opportunity. Many thanks to all who enabled this treat. After our look inside FB we were treated to afternoon tea. We stopped overnight at the new hotel on campus, which was lovely and has special alumni rates. We thoroughly recommend it.